For many years, SMART Recovery has worked with correctional institutions throughout the United States to help provide SMART Recovery meetings for inmates as well as support meetings for those returning to communities. Depending on circumstances, your facility may choose either to provide InsideOut to your population, or you may choose to provide a “general” SMART Recovery meeting. Our FAST Distance Training Program helps prepare counsellors, officers and drug court officials to facilitate general SMART Recovery meetings. Information about making the InsideOut program available to your clients is included below. SMART Recovery materials work equally well with male and female populations, work to lower recidivism rates, and provide a non-religious based choice in recovery, which is crucial to ensuring First Amendment rights are observed. InsideOut is a cognitive-based (CBT) program for substance abuse treatment (offender rehab) in correctional settings, and is based around the 4-Point Program® of SMART Recovery. The primary goal is to prevent offender recidivism through a carefully designed and scientifically-based secular program. Designed for drug courts, correctional institutions (jails, prisons), DUI diversion programs, and related aftercare programs, InsideOut can help your facility to quickly and inexpensively deliver a science-based and engaging substance abuse treatment program. Additional Participant Manuals available in packs to 10. Each Starter Package (available in male or female offender versions) provides materials for the SMART Recovery InsideOut program. 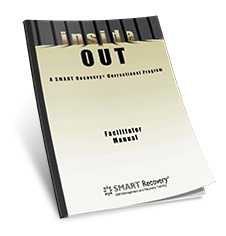 InsideOut Participant Workbook Describes SMART Recovery principles and provides exercises and homework assignments corresponding to each group topic. Handouts and homework for InsideOut meetings. Download (PDF) our InsideOut factsheet by clicking here or get our InsideOut Flyer here. Order InsideOut products from the SMART Recovery Bookstore, or call our Central Office at 866-951-5357. After the purchase of an InsideOut Starter Kit, packages of 10 additional Participants Manuals are available for only $79 + S/H. In this short sample of the Facilitator Training video, Stages of Change are demonstrated to determine how to approach the participants, and to engage others in the group in the discussion. InsideOut includes complete self-paced and convenient DVD video training for corrections counselors. This video shows a participant in InsideOut using the ABC Tool to change the emotional outcome of a situation. Male and female population versions of InsideOut are available. This is a sample of the female participant video. Contact SMART Recovery for more information on SMART Recovery InsideOut materials.